The opioid crisis isn’t only a health issue anymore. 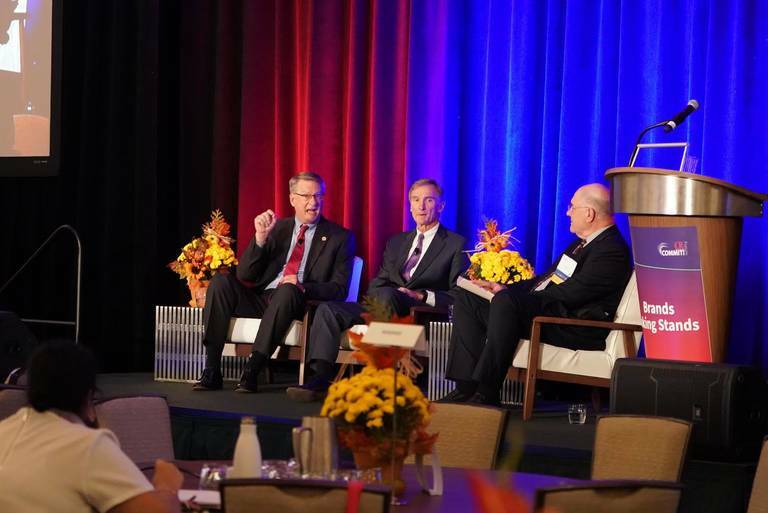 It’s becoming a hot button in corporate social responsibility circles and a catalyst for public and private sectors to unite to fight the epidemic, as Leidos CEO Roger Krone attested to at a COMMIT!Forum panel session on Tuesday. Leidos, a Fortune 500 science-technology company and multibillion-dollar defense contractor based in Reston, Va., has partnered with the state of Maryland to bring awareness to the issue and create programs and volunteer efforts aimed at prevention, enforcement, and treatment. Krone -- gathered on the COMMIT!Forum stage with Clay Stamp, executive director of Maryland’s Opioid Operational Command Center, and moderator John Howell, editorial director of 3BL Media -- is urging other CEOs to join the fight against opioid abuse. Krone first became aware of the severity of the crisis when he received an email from John Hindman, a Pittsburgh-based Leidos employee who had lost his son to an opioid overdose. In his email, Hindman challenged Krone to take action. After looking at the numbers, Krone was shocked by the swath of opioid-related deaths in 2016 alone, exceeding the combined fatalities of U.S. soldiers in Vietnam, Desert Storm, Desert Shield, and Enduring Freedom. Collaborating with the State of Maryland state government and the Chris Atwood Foundation, a Northern Virginia non-profit organization dedicated to assisting opioid addicts, Krone moved forward to launch several initiatives that started a chain of discussion that exposed the breadth and depth of the issue that in some way had touched almost everyone at Leidos. Stamp, the former Ocean City emergency management chief for nearly three decades, provided insight into Gov. Larry Hogan’s decision to declare a state of emergency in Maryland to battle the epidemic and why private-public partnerships dedicated to this issue are so important. The numbers associated with the crisis underscore the need for urgent action. Of the 2,000 people in Maryland who died from opioid overdose last year, 80 percent of those individuals previously had been treated in hospital emergency rooms for non-fatal overdoses. Stamp explained that Gov. Hogan’s decision to declare a state of emergency was a clear call to action. Today, 14 state agencies are working to deliver coordinated efforts and 80 state projects are in the launch phrase or are already underway. Among those is a model for the law enforcement community to help substances abusers enter treatment instead of incarceration. The combined efforts of Leidos and the State of Maryland demonstrate that private-public partnerships can create powerful change if CEOs step up to engage. To learn more about their stand to address the opioid epidemic, visit the Leidos call to action web page and http://beforeitstoolate.maryland.gov.